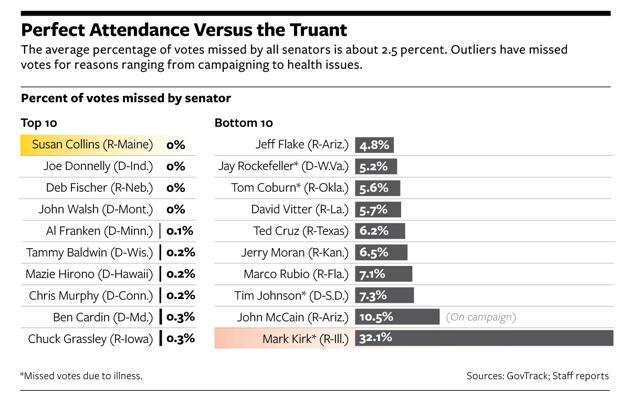 Some senators have been playing truant. If the job you're elected to do is give your constituents a vote in Washington, you should probably be there to vote. On average, the current class of U.S. senators miss 2.5 percent of all the votes during their tenure, according to data from GovTrack. So which senator earns the Perfect Attendance badge? That honor goes to Maine Republican Susan Collins, who has not missed a single vote since her election to the Senate in 1997. "It is a great honor to serve in the U.S. Senate and represent the people of Maine. Voting is one of a senator's most important responsibilities, and I feel strongly about making every effort to be present when the roll is called," Collins said in a statement to National Journal. "People around the country respect Mainers for their strong values and work ethic. I am proud to have continued this voting streak, which was inspired by the legendary Maine Senator Margaret Chase Smith who did not miss a vote for 13 years until surgery forced to her to do so." However, an honorable mention must go to Iowa Republican Chuck Grassley. Grassley has only missed 0.3 percent of votes over his 33-year tenure in the Senate, and he has not missed a vote since 1993, when he was in Iowa inspecting flood damage with President Clinton. Since then, Grassley has cast 6,946 consecutive roll-call votes — the longest voting streak among current senators. "It's not the numbers themselves that matter so much, but people are cynical and wonder if you're really on the job, so when the Senate's in session, I'm in Washington voting, and when the Senate's out of session, I'm in Iowa holding official meetings, including town meetings and question-and-answer sessions in offices, on factory floors, at high schools, and with service clubs," Grassley said. 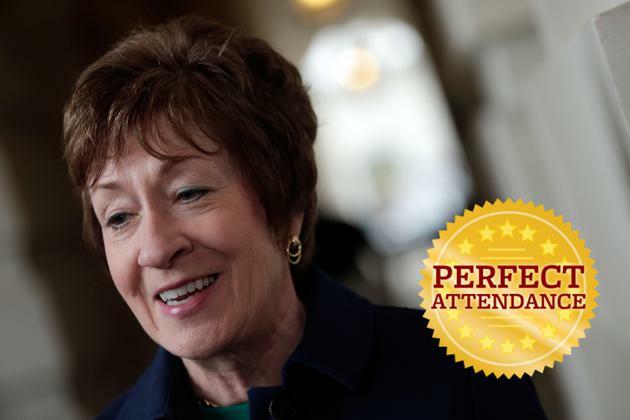 While three other senators also have perfect attendance records — Joe Donnelly, Deb Fischer, and John Walsh — none of them have served as long in the Senate as Collins or Grassley. Vote-attendance records can disproportionately favor senators who have not been in office for very long, since they have had fewer votes to miss in the first place. But it's a double-edged sword: If you're a senator who hasn't been in office for long, even a handful of missed votes can make you look like a slacker. Of course, there are perfectly legitimate reasons to miss votes. Sen. Mark Kirk was understandably absent in 2012 after suffering a debilitating stroke, and missed an entire year's worth of votes. Similarly, Sen. Tim Johnson was prevented from voting after suffering from a brain hemorrhage in 2006. Sen. Jay Rockefeller had back surgery in 2006, causing a spike of missed votes. And Sen. Tom Coburn, who is retiring after this term, announced last November that he had been diagnosed with prostate cancer. Other senators have missed votes for reasons both personal and political. Ted Cruz, who joined the Senate in January 2013, missed votes for national and international events. "Senator Cruz places top priority on being present during Senate votes, but as all members of Congress, sometimes has conflicts," a spokesperson for Cruz told National Journal. "More than half of missed votes were due to travel to Nelson Mandela's funeral and the Fort Hood Memorial [congressional delegation]. Others were due to delayed flights, family obligations, and previously scheduled events, including those with the Bush Library dedication, Liberty University, UVA, and the Heritage Foundation." Both Arizona senators made the bottom 10 list. John McCain, unsurprisingly, missed many votes while he was on the presidential campaign trail in 2008. "Most people understand that when running for president, you're unfortunately going to miss votes," a McCain spokesman told National Journal. "Arizonans understand that, and overwhelmingly reelected him in 2010." And fellow Republican Jeff Flake, who also joined the Senate in 2013, missed votes last year to attend a memorial service for the firefighters who died in the Yarnell Hill wildfire, and to attend his son's wedding. "Sen. Flake takes seriously his duty to represent Arizonans in Washington, and tries to be present for every vote, although that's not always possible," a Flake spokesperson said. Sen. Marco Rubio, who has missed 7.1 percent of votes since taking office in 2011, also cited familial duties for his absence. "Senator Rubio takes his responsibilities as both a senator and a father seriously. The vast majority of missed votes are when the latter duties take precedent, and he needs to be in Miami for family commitments. He is one of the only senators with young children who has not moved his family to D.C., and tries to spend as much time in Florida with them as possible," a Rubio spokesman said. "In addition to his parental responsibilities, in recent years he's also had to return to Florida and miss votes due to his mother's health and civic responsibilities like jury duty. Normally when he misses votes, his vote would not have been decisive, but in those instances he tries to submit statements for the record or writes a blog post explaining how he would have voted." Requests for comment from the offices of Sen. David Vitter and Sen. Jerry Moran were not returned. This is the first part of National Journal's series on Senate Superlatives, which analyzes members of Congress by different metrics and grades their performance.